Optional — two oranges, which makes this melemel and not mead. 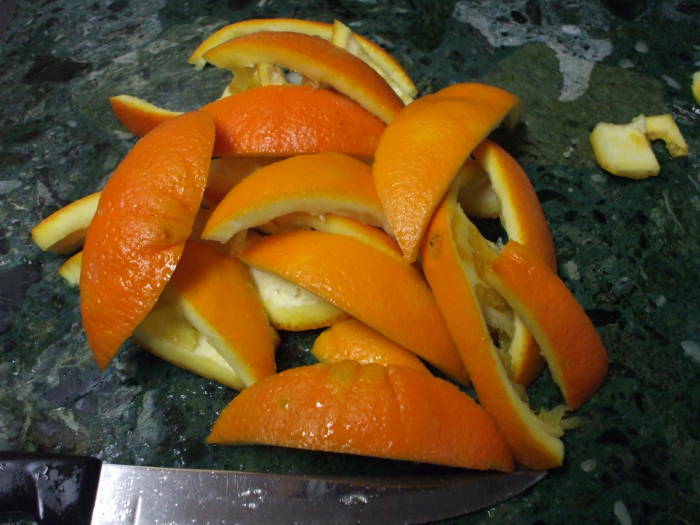 Get a variety with a thick, dark orange peel, not the ones with a nearly yellow and very thin peel. If you're into the whole Viking thing, you'll need to get these through trade with merchants from the Mediterranean or perhaps Persia or Baghdad. That means a sea voyage down the Atlantic coast into the Mediterranean, or a river voyage (with some portages) to the Black Sea or Caspian Sea. Start chilling about half the water to a few degrees above freezing. Cut up the oranges and eat the fruit. Go ahead, they're good for you. Linus Pauling certainly thought so, and he was awarded a Nobel Prize in chemistry. Lots of ascorbic acid and some fiber, but mostly they taste very good. I have read, here, for example, that the yellow-white pith can cause a bitter or even soapy aftertaste. 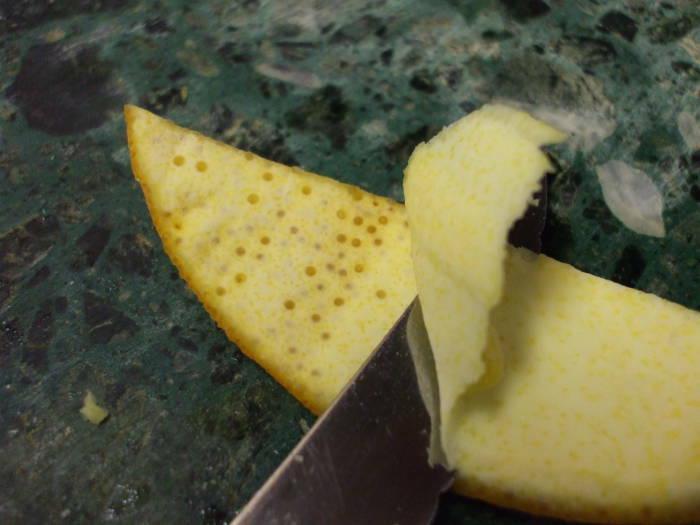 So, slice the peel sections to remove much of the pith and then use a grater to remove most of the rest. 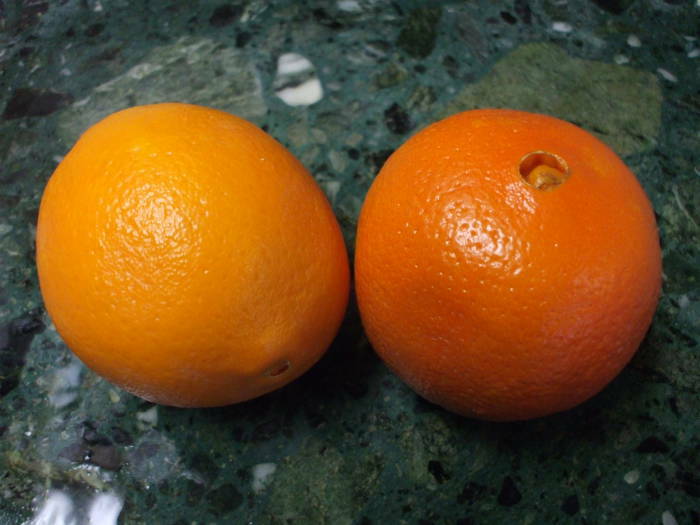 You should be left with little more than the dark orange outer peel. 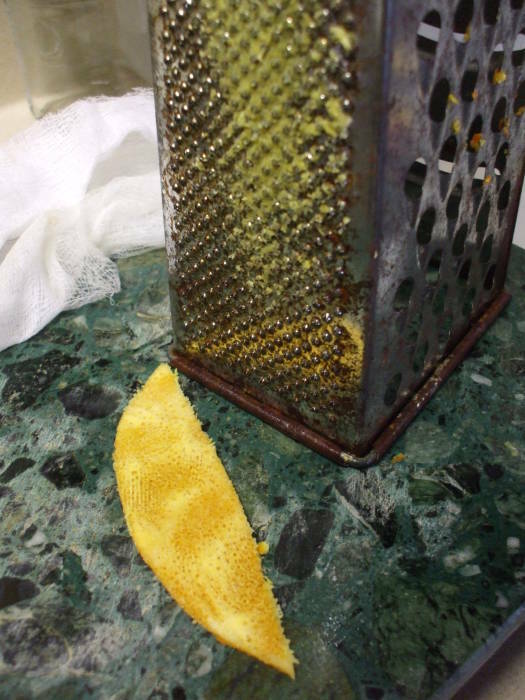 Cut those peels into strips 0.5 to 1 cm wide, and tie the peel strips into a ball of cheesecloth. I had purchased a packet of cheesecloth from a place called Hobby Lobby. The package claimed that it was "food grade", which I am happy to assume is equivalent to "beverage grade". The package also claimed that cheesecloth "has hundreds of uses" and showed examples of some of those. Somewhat surprisingly, mead brewing was not shown! Well, maybe that's not so surprising after all. 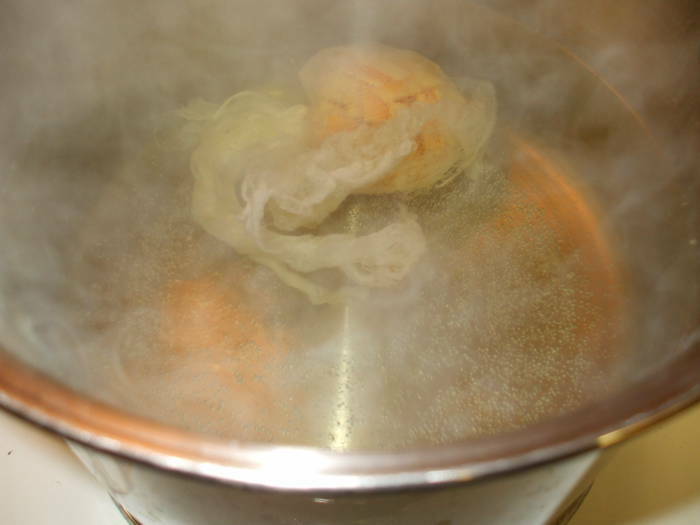 Steep the orange peel by heating 4 liters of water until it just starts boiling. 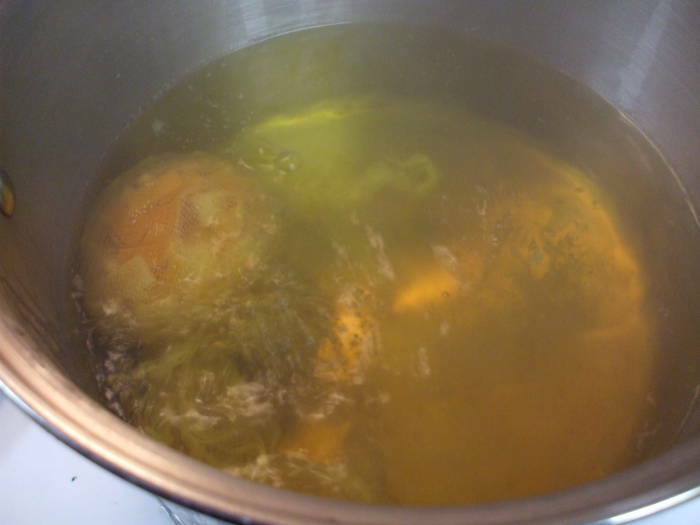 Then place the cheesecloth ball of orange peel into the water. The water very quickly takes on a light orange tint. I left the orange peel in at a very low boil for about 30 minutes. The water was noticeably darker by then. 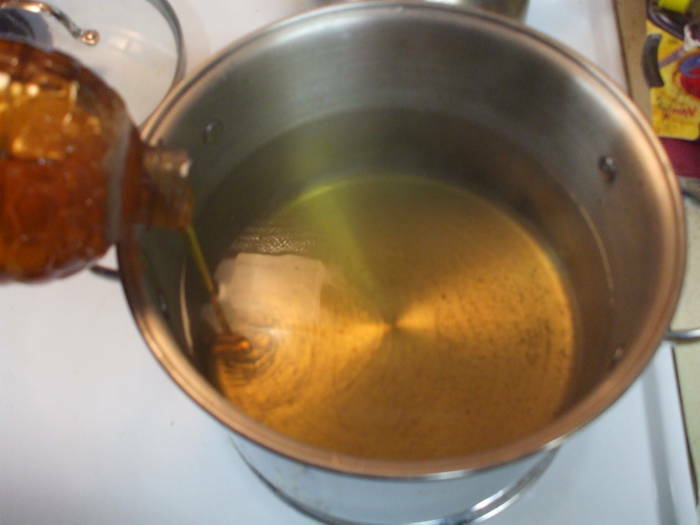 Now it was time to prepare the must, the unfermented honey-water mix. The must is to mead as the wort is to beer, it's the initial liquid heated and mixed before the yeast is added for fermentation. As my largest pot only holds about 11 liters, I had to prepare the must in batches. The honey was in three 2.35 kg bottles, so I did three batches of three to four liters of water with one bottle of honey, starting with the 4-liter orange-steeped batch of water. Heat 3 to four liters of water until it just starts boiling. 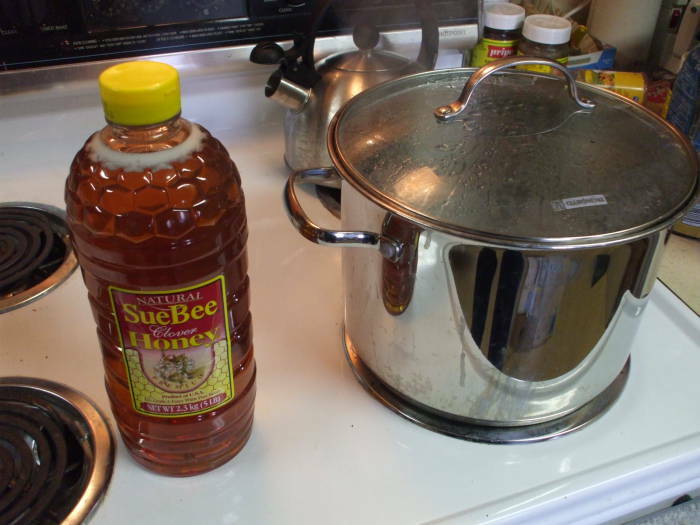 Then pour one of the three containers of honey into the lightly boiling water. 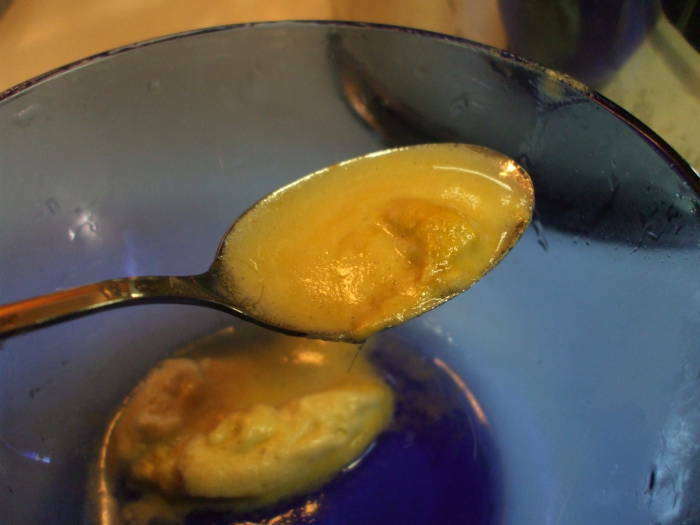 There is a strange effect as the honey forms a mostly separate layer below the water. You can see it puddling on the pot bottom. There is a lot of debate over boiling mead must. Scientific logic: Full pasteurization of the honey will kill any wild yeast. The Belgians make some crazy fermented beverages with their native wild yeasts, but it tends to fail unless you're blessed with similar local yeast flora. Dogma: "This is brewing, and when brewing you alway boil the must." Scientific logic: Honey naturally contains a number of aromatic components and some will be lost through boiling. 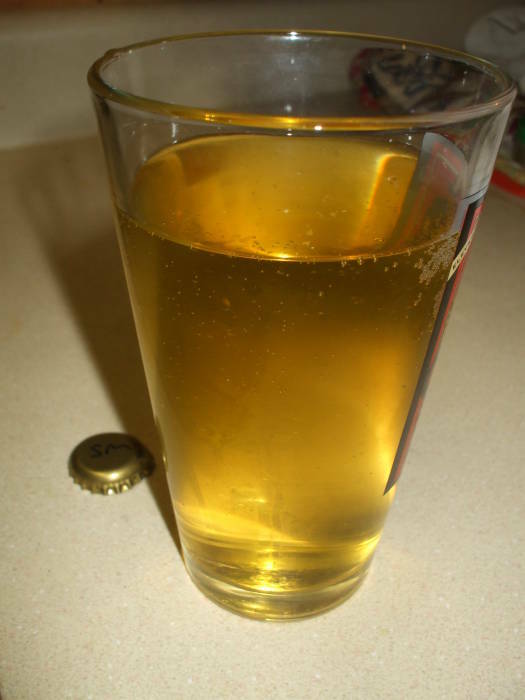 Dogma: "The earliest mead, like the earliest wine and beer, was accidental and almost certainly was not boiled." As you can see, I'm a boiler. Well, I'm a Boiler, as in a Boilermaker, a Purdue University engineering graduate, and so I don't see that there's any such thing as an over-application of technology. 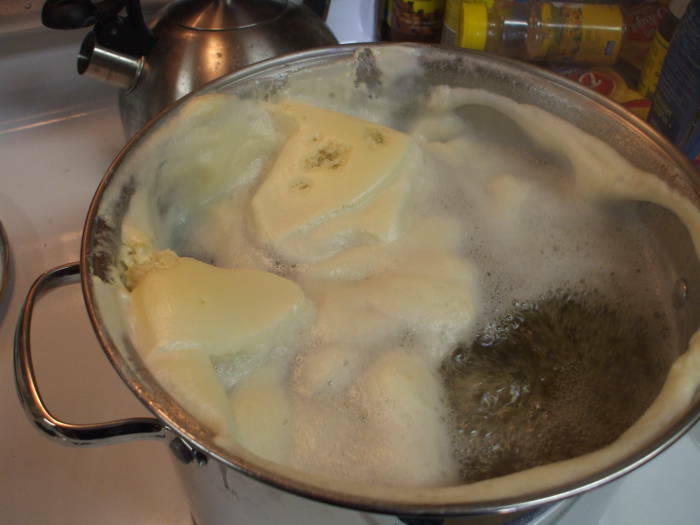 Anyway, I boiled each must batch for about 20 minutes, enough for adequate pasteurization and to float out all the bees' knees and other hive debris. I spooned out the gloopy blocks of foam. 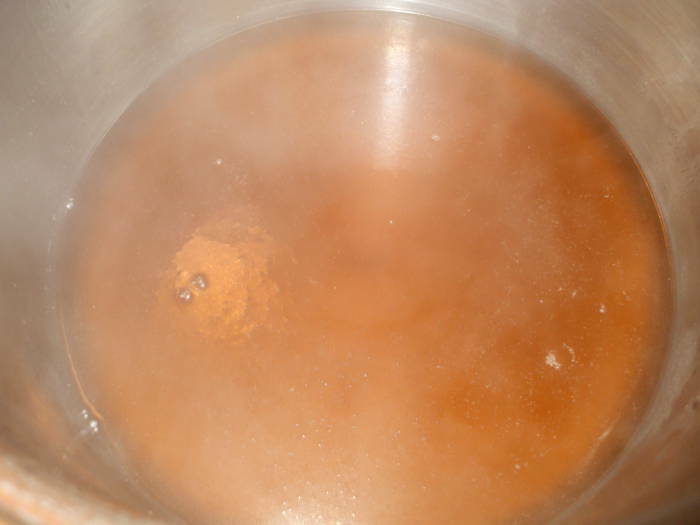 Once it boiled fairly clean, I added that must to the chilled water already sitting in the fermentation vessel. 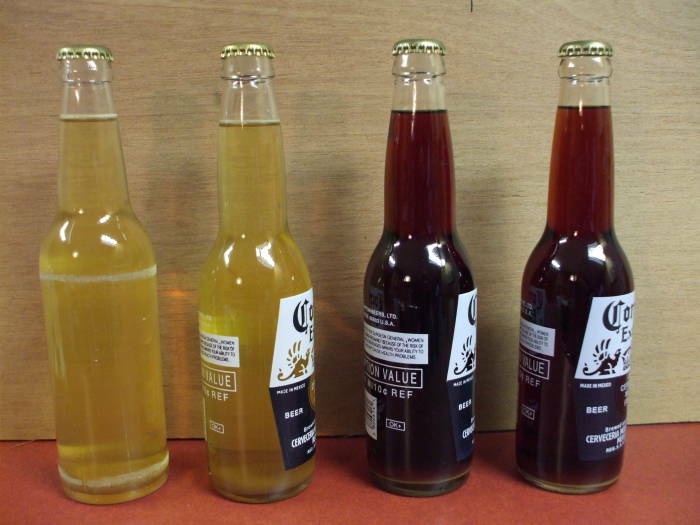 Now speculate on the very sketchy mead guidance provided in The Complete Joy of Homebrewing. 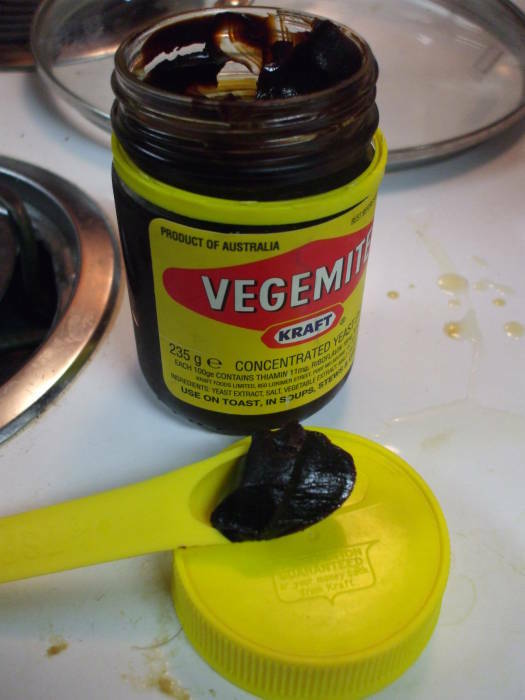 I decided that when they say that "a half-ounce of yeast extract" can provide needed yeast nutrients, they surely meant something like Vegemite! Dissolve 3 ml (a heaping half-teaspoon) of Vegemite in the final liter of water set aside for this purpose. Marvel at how such a small amount of Vegemite can taint the color and taste of a large volume of water. 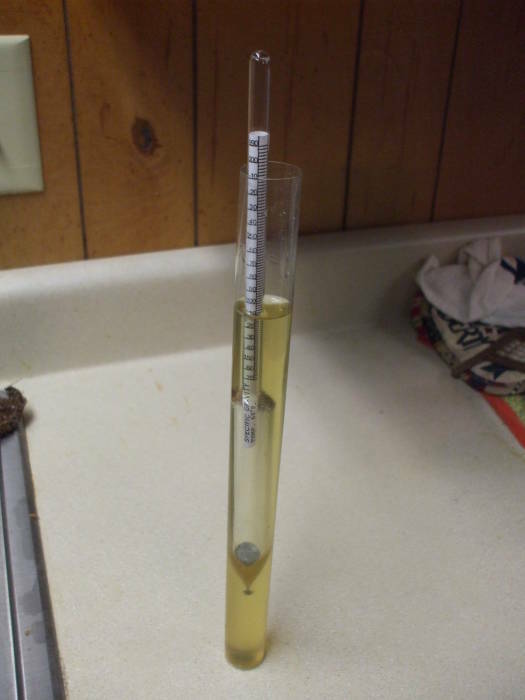 Once the fluid in the fermentation vessel is down to room temperature, measure the initial specific gravity. Hopefully this will be much less nasty than the Viking Malt Liquor I made once. Time to open a bottle from the previous batch. Yes, I bottle in clear glass bottles. Many people say that you shouldn't do this, but what they really mean is that you shouldn't let light hit your brewed beverages. I store bottles in case boxes which are enclosed in black plastic garbage bags ("bin bags" if you happen to speak English as opposed to Colonial English), and I am reasonably certain that the light in my refrigerator goes out when the door closes. So, I feel free to use clear glass bottles that let me much better see the contents. 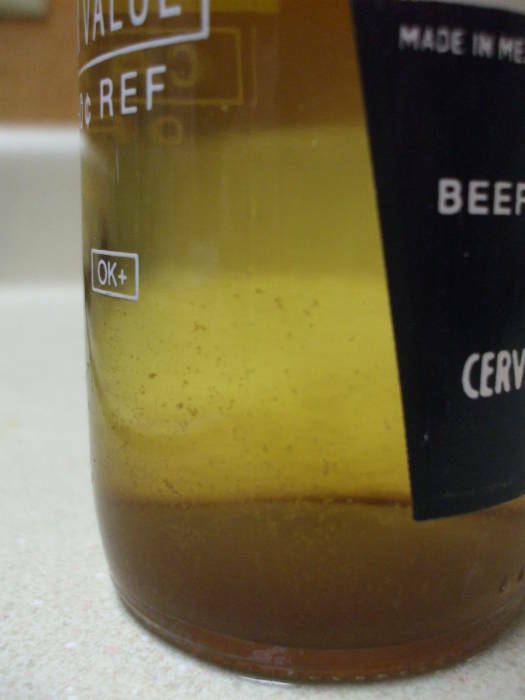 There is a solid layer of sludge on the bottom of the bottle. Remember the picture of the Vegemite? It's that stuff, more or less. 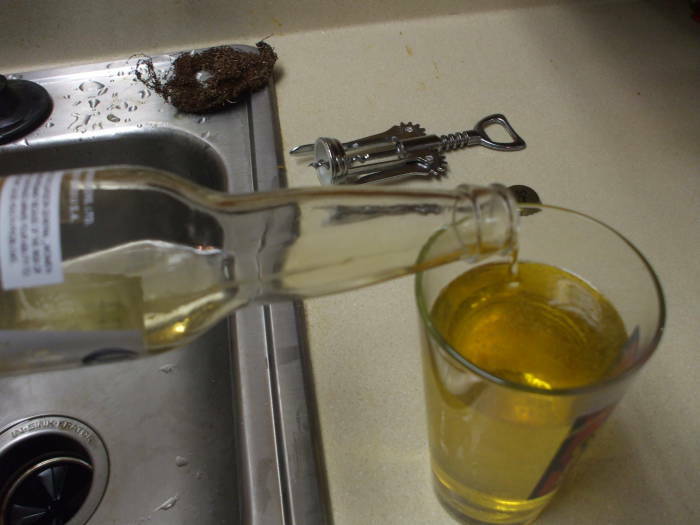 Tip the bottle just enough to pour the liquid while not pinching off the air flow above. Let it pour smoothly, avoid the glug-glug-glug. Stop before the sludge leaves the bottle. Yes, you lose about a 1 cm layer of liquid. But the result is a clear glass, not something clouded with yeast sludge. You are about ready to "pitch the yeast". That is, to add the yeast. I don't know why you're supposed to say "pitch" instead of "add" unless it's some sort of shibboleth. Anyway, this stuff will become strong. See the initial gravity reading above. 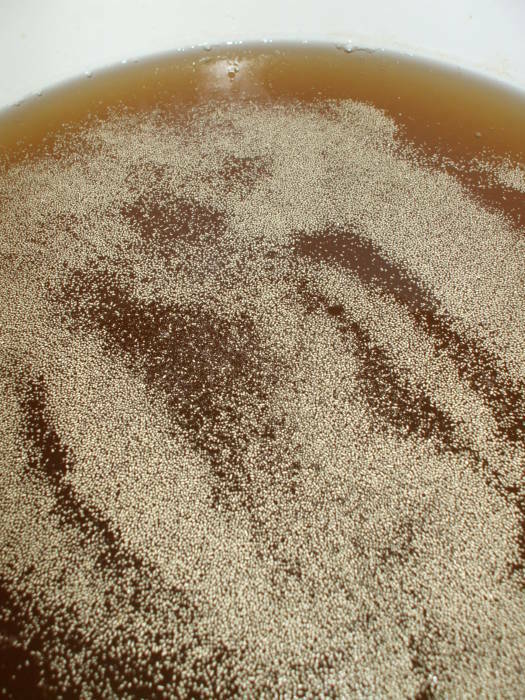 The yeast need to be tolerant of higher alcohol levels. Use Champagne yeast if it's available. I also poured a glass of mead from the previous batch (as seen above) and then swirled its sludge and added that to the fermenter. Who knows, maybe there are still some viable yeast in that sludge. Maybe they're tough yeast beasts that survived fairly high ethanol concentrations followed by several months of storage first at room temperature and then refrigeration. Now it's time to cap the fermenter and wait for the yeast to multiply into the billions and do their magic to convert the complex sugars of the honey into ethanol and carbon dioxide. About 80 days later the specific gravity had dropped all the way to 1.008. Siphon into a tapped bucket. 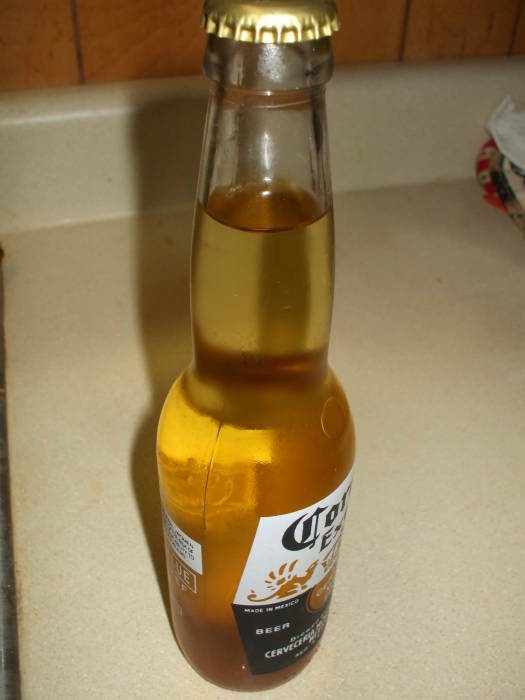 Bottle in the nice clear bottles recycled by Corona drinkers.